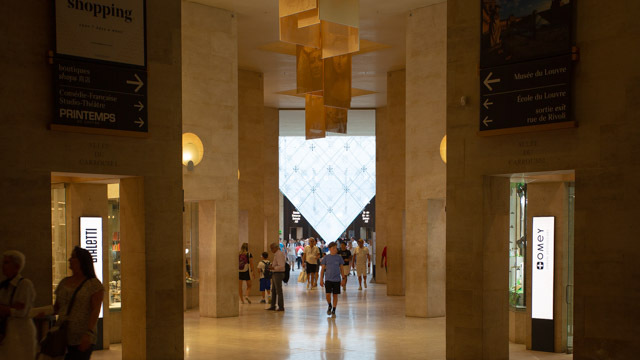 La Pyramide Inversée (The Inverted Pyramid) is a skylight constructed in the Carrousel du Louvre shopping mall in front of the Louvre Museum in France. It may be thought of as a smaller sibling of the more famous Louvre Pyramid proper, yet turned upside down: its upturned base is easily seen from outside. The pyramid marks the intersection of two main walkways and orients visitors towards the museum entrance. Tensioned against a 30-tonne (33-short-ton), 13.3-metre (44 ft) square steel caisson frame, the inverted pyramidal shape in laminated glass points downward towards the floor. The tip of the pyramid is suspended 1.4 metres (4.6 ft) above floor level. Individual glass panes in the pyramid, 30 millimetres (1.2 in) thick, are connected by stainless-steel crosses 381 millimetres (15.0 in) in length. After dark, the structure is illuminated by a frieze of spotlights. Directly below the tip of the downwards-pointing glass pyramid, a small stone pyramid (about 1 m, 3.3 ft) is stationed on the floor, as if mirroring the larger structure above: The tips of the two pyramids almost touch.